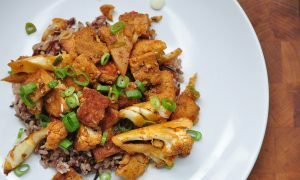 This Gochujang Tofu with Cauliflower is another quick weeknight meal that is easy to throw together if you come home late and want to get something into your belly quickly. 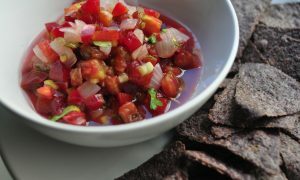 I’m imagining you had to work late and are craving something light and healthy but flavorful. If you prepare the tofu to marinate in the morning before you leave the house it will be ready to go when you are home that night. You’ll be so happy with your morning self for being so prepared AND you won’t have to agonize over what to eat, just execute! 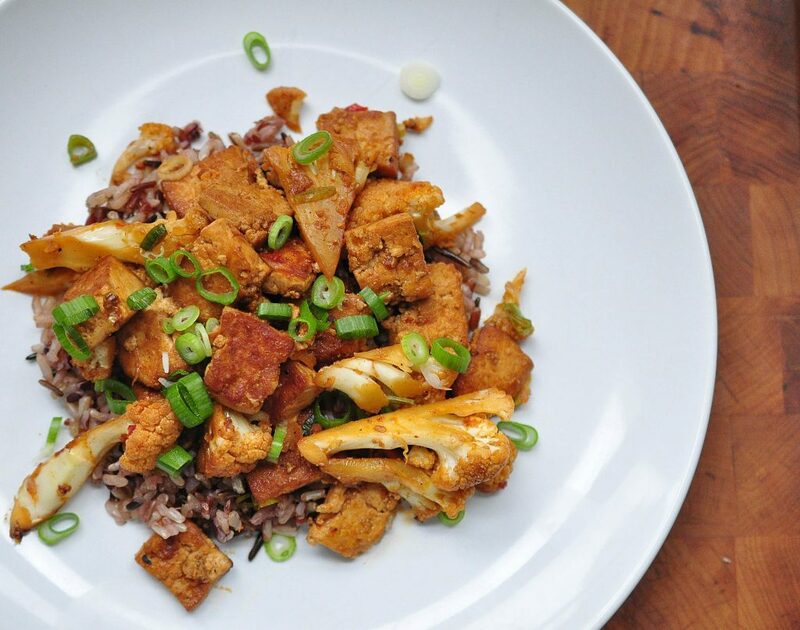 A quick, light, weeknight meal of marinated tofu and cauliflower spiked with gochujang. Cut the tofu into 1/4 inch cubes. Dump them into a plastic sandwich bag or a tupperware container and pour the soy sauce over the tofu. Shake it up. 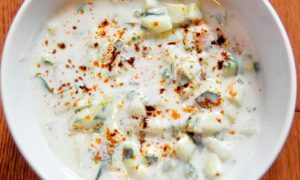 Leave it for 1 hour in the fridge or for several hours overnight or while you're at work. 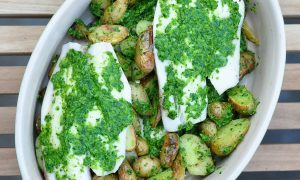 Place a cast iron skillet on medium high heat. Add the butter, let it melt and swirl it around the pan to coat. Add the tofu to the pan and shake it so that most of the cubes are laying flat against the pan. Let them cook untouched for 2 minutes. Flip them or toss and shake the pan around. Continue to do this until the tofu cubes are nicely brown on 2 to 3 sides. Meanwhile mix up the ingredients for the sauce in a small bowl. Add the cauliflower to the pan along with 1/2 cup of water. Leave it for 2 minutes. Toss and let it cook another 2 minutes or until the water as cooked off. Add the sauce and another 1/4 cup of water to the pan and coat everything. Let it cook, tossing occasionally until all the water is cooked off and the cauliflower can be easily pierced with a fork. 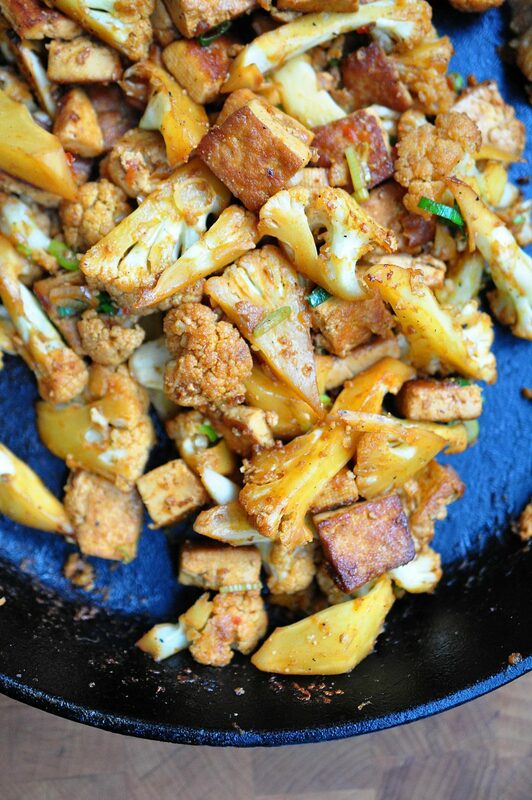 Let it cook for another minute so you can get some nice crispy caramelization on the tofu and cauliflower. Taste a piece of tofu and a piece of cauliflower. If it needs more salt or spice then add soy sauce or gochujang. If it seems tasty and cooked enough turn off the heat and add the scallions. Toss it all together and serve. Serve on its own, or on a bed of rice or noodles. This dish keeps well in a sealed container for 2 to 3 days. 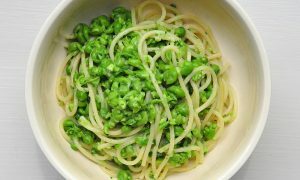 Recipe is great but you should move the scallions to the forst part of the list. I added them to the sauce rather than later.